Surprisingly, this little fly fishes well in the open ocean and in estuarine habitats like Puget Sound and the Frasier River in BC. The fly is small but predatory fish from sea run cutthroat to Black Rockfish know how to key in on little prey and have no problems finding these flies when they are featured on the menu. 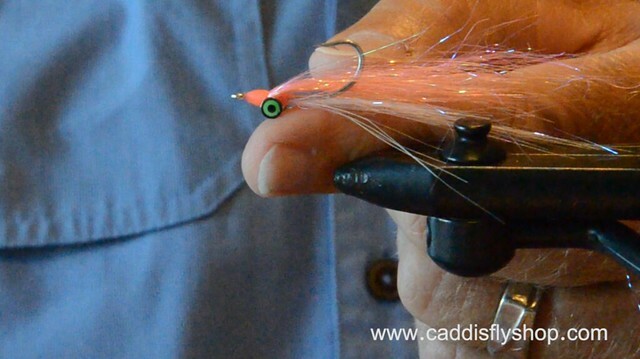 Fishing these flies in estuaries is best done with floating and intermediate lines, using little twitches to keep the fly in the upper few inches or feet of the water. I have found that the sink rate of the fly in increased as heavier layers of Cure Goo are added, so if you plan to fish this fly in a few feet of water, like is common where Sea Run Cutthroat lurk in the spring; you want to keep the Goo layer relatively thin. When fishing Pacific Rockfish around kelp and over reefs in 20 ft of water with fast sinking fly lines, you may make the Goo layer quite thick and this makes for a more easily detectable fly that the fish will take with solid approval. As always, experiment and vary the color combinations to suit your local conditions and personal preferences. This entry was posted in Fly Tying, Fly Tying Materials and Supplies, Oregon Salmon fly fishing, Oregon Saltwater Fishing. Bookmark the permalink. When you use the name Rockfish, or Black Rockfish, I have no idea what kind on fish you’re talking. Are you talking Stripers/Striped Bass or something else? Have you ever used the Eagle Claw 413-1 (w/ an 60 deg. bend) hook for tying Clousers? So I have a couple questions. What is a 3407? I have heard of 787 and 747, but not 3407…is this a type. What is shimmer fringe? My ex wife Pearl had fringe but it did not shimmer. Can I substitute that is I add some of that Flashabou? What are pseudo eyes? If they were really pseudo, they would not exist, would they? Why the green color….most eyes are blue or brown. If I use blue real eyes, would that work. Sorry to pull you away from the weekend, but when I have questions, I ask them. First, the Black Rockfish I refer to is a native Pacific fish found from California through Alaska ocean waters: Sebastes melanops (often referred to as black bass, black rock cod, sea bass, black snapper) is definitely a different species from the striped bass Morone saxatilis or atlantic striped bass, striper that is native to the Atlantic but introduced here in the Pacific. Stripers live up to 30 yrs and have achieved weights of over fifty pounds. The black rockfish apparently can live close to fifty years but does not get nearly as large as stripers. Good sized black rocks we catch are more in the 3-6 pound range. Black rockfish maximum sizes seem to be in the 10 pound range. The blacks are pelagic but often associated with rocky reefs offshore. Schools of black rockfish do move around chasing baitfish but I am not aware of these fish ever storming the beaches like i have seen video of stripers on the east coast. Home range of the blacks is probably more in the range of several miles but stripers can move around hundreds of miles if I understand right. All this is drivel from the internet so I invite you to do a browse yourself. What I can tell you from experience is that the black rockfish sometimes key in on little mushy white (don’t know what it is) goo and baby crabs, and shrimp, and baitfish of all sizes. The blacks we catch are usually in 40-80 ft of water but the fish may be deep in the water or sometimes come leaping out of the water chasing baitfish. A really common depth the last few seasons has been more in the 15-30 ft range and these fish are easily accessible with sinking lines like the RIO Striper Line and AIRFLO Sniper or 40+. Hope this helps a little.